[New for 2013] East coast purveyor of main stream ice cream, Friendly's, decided to jump into the ice cream treat market this year. They've been going through a massive restructuring with their restaurants so maybe this is somehow an offshoot of their efforts to get back in touch with the people. Now I do apologize for not getting these on sooner, but today I finally decided to give in to the 2 for $5 sale. Now they've got a whole line up of treats, but to me, nothing is more uniquely Friendly's then these new Signature Black Raspberry ice cream bars. 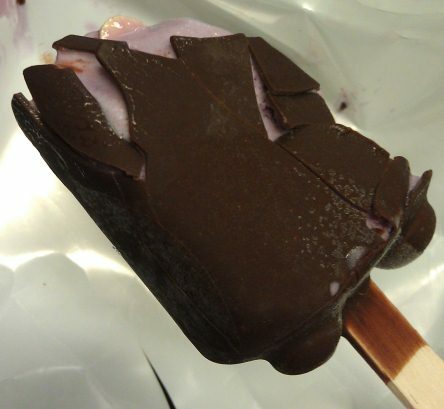 When I was a kid and I got a cone from Friendly's, it was either black raspberry or rocky road. Both were excellent, and when I went off to college I would often split a half gallon of black raspberry with my wife. 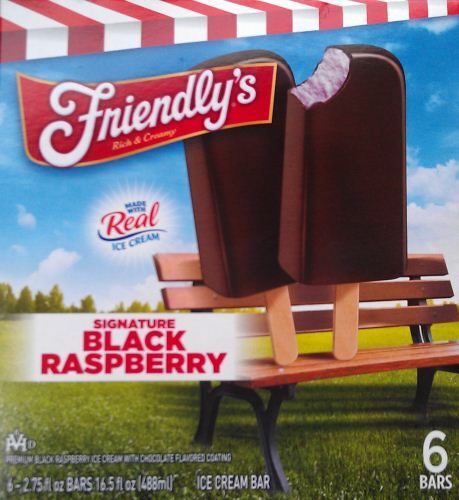 To be honest, I haven't come across a better black raspberry flavor than Friendly's. Ok, they've got some Friendly's branding on here, but nothing too specific. Doh, it's cracked all over the place, plus it feels light as it clocks in at a mere 54 grams and 180 calories. This is not a big treat. I do smell chocolate though, so that's cool. I take my first bite and the shell cracked everywhere (yet somehow I ate this treat without wearing it). That distinct Friendly's black raspberry flavor is present and trying to be the predominant player here. The shell is nice middle of the road chocolate coating, not bitter or dry, but it's very thin. The ice cream filling isn't quite the same consistency as their usual ice cream, so it's not really supporting the shell either. Overall I'm enjoying this treat, but I'm going to hold off further opinion because this thing is super soft right now. I need to refreeze and attack again later. On Second Scoop: Alright, I've taken two more breaks with this bar, and while my experience is pretty much always the same, overall, I'm a happy camper. I think the shell is the best and worst part of this treat. It's the worst because it's thinness means it cracks endlessly as you eat it, but at the same time it's the best because it's just so much fun to crunch. You get a lot of it on every bite so you can find yourself crunching on every bite (if you want). It's just fun, and I love the sweet black raspberry filling. You'll probably make a mess, but don't be afraid to put these on your summer shopping list. Unsure where you're located.. but the BEST Black Raspberry is made by the ice cream man in Upstate NY ( I am in Saratoga Springs and you can get it at the meat house here .. ) .. if you can get YOUR hands on it .. worth every creamy bite. Ive become a big Friendlys fan because of their prices, and really love their black raspberry and French vanilla cartons. Would love to see some more friendlys reviews on the blot! @Adam: hopefully we'll cover all the new products, slowly but surely! @Lisamarie: I feel like I've seen some of the ice cream man pints in shoprite. I'll have to go check if my eyes weren't deceiving me because I love a good black raspberry. I have these in my freezer too and like you went with these because all the other flavors are just generic. I think they're pretty good. Mine haven't cracked like yours did Dubbs, maybe you got a bad batch? @Lisamarie: I just realized you said you can get it at the meat house. I'll have to stop there next time I'm in the area. I have not had Friendly's but I would argue that Graeter's out of Ohio makes the best Black Raspberry. I am new to your blog, but excited because I love ice cream so I am not sure if you have reviewed Graeter's. If not, you need to get on that! How about we say Friendly's has my favorite "main stream" black raspberry.